The battleship USS New Jersey fires at positions near Beirut on 9 January 1984 during the Lebanese Civil War. The United States battleship retirement debate was a debate among the United States Navy, Marine Corps, Congress, and independent groups over the effectiveness of naval gunfire support (NSFS) provided by Iowa class battleships, and whether or not an alternative should be implemented. The debate centered on the best way to provide fire support for amphibious assault and other troops near a shoreline. The debate at large traced its roots back to the end of World War II, but this round of the debate began in 1992 with the decommissioning of the last active battleship, USS Missouri (BB-63) and ended when the last of these ships was finally completely retired in 2011. The Navy decommissioned Missouri after determining that her fire support function could be replaced by ship and submarine-launched missiles and aircraft-launched precision guided munitions. Many still viewed the battleships as essential for gunfire support, and questioned the Navy's decision. Congress required the Navy to retain at least two of the four remaining battleships on the Naval Vessel Registry (NVR) instead of disposing of them. The debate played out across a wide spectrum of media, including newspapers, magazines, web blogs, and congressional research arms including the Government Accountability Office. Each side presented different arguments on the best approach to the problem. Many participants favored the continuation of the Zumwalt class or the reinstatement of the Iowa-class battleships to the NVR. The Iowa-class battleships and the Arleigh Burke- and Zumwalt-class destroyers all entered the debate as options put forward for naval gunfire support, while others advocated the use of specifically designed close air support planes and newer missile systems that can loiter in an area as a replacement for naval gunfire. The debate about retention of the battleships became completely academic in 2011 when the last battleship owned by the Navy, USS Iowa, was donated to a non-profit group to be used as a museum ship. USS Wisconsin, shown moored in Norfolk, Virginia, is one of four Iowa-class battleships open to the public as museums, and was one of two maintained for potential reactivation until 2009. By 1947, the United States had deactivated all of its remaining battleships (bar Missouri) and placed them in the United States Navy reserve fleets. By 1964, all but the four Iowa-class battleships had been stricken from the Naval Vessel Registry (NVR), but on several occasions one or more of those four battleships were reactivated to provide naval gunfire support. The U.S. Navy retained the four Iowa-class battleships long after other nations scrapped their big-gun fleets. Congress was largely responsible for keeping the four Iowa-class battleships in the United States Navy reserve fleets and on the NVR as long as they did. The lawmakers argued that the battleships' large-caliber guns had a useful destructive power that was lacking in the smaller, cheaper, and faster guns mounted by U.S. cruisers and destroyers. In the 1980s, President Ronald Reagan proposed creating a 600-ship navy as part of the overall defense department build-up to counter the threat of the armed forces of the Soviet Union; both the Soviet Army and Navy had grown in the aftermath of the unification of Vietnam in 1975 and the loss of faith that Americans had in their armed services. As part of this, all four Iowa-class battleships were modernized and reactivated. When the Soviet Union collapsed in 1991, the 600-ship navy was seen as unnecessary, and the navy made plans to return to its traditional 313-ship fleet. This led to the deactivation of many ships in the navy's fleet, including the four reactivated battleships; all were removed from service between 1990 and 1992. The navy struck all four ships and had made plans to donate them, but Congress intervened with the passing of the National Defense Authorization Act of 1996. Section 1011 required the United States Navy to reinstate to the Naval Vessel Register two of the Iowa-class battleships that had been struck by the navy in 1995; these ships were to be maintained in the United States Navy Reserve Fleets. The Navy was to ensure that both of the reinstated battleships were in good condition and could be reactivated for use in Marine Corps' amphibious operations. Both battleships were to be maintained with the reserve fleet until such a time as the navy could certify that it had within its fleet the operational capacity to meet or exceed the gunfire support that both battleships could provide. To comply with this requirement, the navy selected the battleships New Jersey and Wisconsin for reinstatement to the Naval Vessel Register. The navy saw the battleships as prohibitively expensive, and worked to persuade Congress to allow it to remove Iowa and Wisconsin from the Naval Vessel Register by developing extended-range guided munitions and a new ship to fulfill marine corps requirements for naval surface fire support (NSFS). The navy plan originally called for the extension of the range of the 5-inch (127 mm) gun on the Flight I Arleigh Burke-class guided missile destroyers with Extended Range Guided Munitions (ERGMs) that would enable the ships to fire precision guided projectiles about 40 nautical miles (70 km) inland. The ERGM program was initiated in 1996, but cancelled in 2008 due to rising cost and disappointing results. The similar Ballistic Trajectory Extended Range Munition (BTERM) program was also cancelled in 2008 for the same reasons. These weapons were not intended or expected to satisfy the full range of the marine corps requirements. The result of the effort to design and build a ship that could provide effective fire support was the Zumwalt-class destroyer program which derived from the SC-21 program. The ship was to mount a pair of Advanced Gun Systems capable of firing specially designed Long Range Land Attack Projectiles some 60 miles (100 km) inland. Originally, the navy had planned to build a total of 32 of these destroyers, but the increasing cost of the program led the navy to reduce the overall number of destroyers from 32 to 24. In 2007 the total procurement of Zumwalt-class destroyers was further reduced to seven, before being discontinued at a total of three destroyers in July 2008 as a result of the high per-ship cost. The discontinuation of the class was due in part to concerns that the Zumwalt-class ships would deprive other projects of needed funding, a concern that was raised by the Congressional Budget Office (CBO), Congressional Research Service (CRS), and the Government Accountability Office, all of which issued reports that suggested that total cost of each ship would be as high as $5 billion or more. In addition to the high cost, naval officials discussing the cancellation of the DD(X) program cited the inability of the DD(X) to fire the Standard missile[disambiguation needed] or provide adequate air defense coverage, and a "classified threat" which the navy thought could be better handled by existing or new Arleigh Burke-class destroyers than by the Zumwalt-class destroyers. The article also reported that the Marine Corps no longer needed the long-range fire support from the Zumwalts’ 155 mm Advanced Gun System because such fire support can be provided by much longer-ranged Tactical Tomahawk cruise missiles and precision airstrikes. "DDG 1000 Zumwalt is [...] being developed by the Navy to serve as the backbone of tomorrow’s surface fleet. DDG 1000 Zumwalt provides a broad range of capabilities that are vital both to supporting the Global War on Terror and to fighting and winning major combatant operations. Zumwalt’s multi-mission warfighting capabilities are designed to counter not only the threats of today, but threats projected over the next decade as well." On 17 March 2006, while the ERGM and DD(X) programs were under development, the Secretary of the Navy exercised his authority to strike Iowa and Wisconsin from the Naval Vessel Register, which cleared the way for both ships to be donated for use as museum ships. The United States Navy and the United States Marine Corps had both certified that battleships would not be needed in any future war, and had turned their attention to completion of the next generation Zumwalt-class destroyers. This move drew fire from sources familiar with the subject; among them were dissenting members of the United States Marine Corps. These dissenters argued that battleships were still a viable solution to naval gunfire support, including members of Congress who remained "deeply concerned" over the loss of naval surface gunfire support that the battleships provided, and a number of independent groups such as the United States' Naval Fire Support Association (USNFSA) whose ranks included former members of the armed service and fans of the battleships. Although the arguments presented from each group differed, they all agreed that the United States Navy had not in good faith considered the potential of reactivated battleships for use in the field, a position that was supported by a 1999 Government Accountability Office report regarding the United States Navy's gunfire support program. "In summary, the committee is concerned that the Navy has foregone the long-range fire support capability of the battleship, has given little cause for optimism with respect to meeting near-term developmental objectives, and appears unrealistic in planning to support expeditionary warfare in the mid-term. The committee views the Navy’s strategy for providing naval surface fire support as 'high risk,' and will continue to monitor progress accordingly." In response, the navy pointed to the cost of reactivating the two Iowa-class battleships to their decommissioned capability. The navy estimated costs in excess of $500 million, but this did not include an additional $110 million needed to replenish the gunpowder for the 16-inch (406 mm) guns, needed because a survey found the powder to be unsafe. In terms of schedule, the Navy's program management office estimated that reactivation would take 20 to 40 months, given the loss of corporate memory and the shipyard industrial base. Reactivating the battleships would have required a wide range of battleship modernization improvements, according to the navy's program management office. At a minimum, these modernization improvements included command and control, communications, computers, and intelligence equipment; environmental protection (including ozone-depleting substances); a plastic-waste processor; pulper/shredder and wastewater alterations; firefighting/fire safety and women-at-sea alterations; a modernized sensor suite (air and surface search radar); and new combat and self-defense systems. The navy's program management office also identified other issues that would strongly discourage the Navy from reactivating and modernizing the battleships. For example, personnel needed to operate the battleships would have been extensive, and the skills needed might not have been available or easily reconstituted. Other issues included the age and unreliability of the battleships' propulsion systems and the fact that the navy no longer maintained the capability to manufacture their 16-inch gun system components and ordnance. The navy must prepare plans for the rapid reactivation of Iowa and Wisconsin should they be returned to the navy in the event of a national emergency. These four conditions closely mirrored the original three conditions that the Nation Defense Authorization Act of 1996 laid out for the maintenance of Iowa and Wisconsin while they were in the Mothball Fleet. During the period of time in which the battleships were out of commission in the United States, several technological updates and breakthroughs enabled naval ships, submarines, and aircraft to compensate for the absence of big guns within the fleet. During World War II, aircraft were used with devastating effect for both strategic bombing and for close support of ground troops, by all combatants. Land-based aircraft were effective when the airfields were in range of the targets and when a degree of air superiority could be established. Carrier-based aircraft were originally intended for use against enemy ships. In addition to this role, several aircraft like the P-47 Thunderbolt were employed for close air support for ground based troops in Europe and in the Pacific. F4U-5 Corsairs provide close air support to U.S. Marines during the Battle of Chosin Reservoir, December 1950. By the time of the Korean War, air power had been supplemented by the introduction of the jet engine, which allowed fighter and bomber aircraft to fly faster. As with their World War II predecessors, the newer jet aircraft proved capable of providing close air support for ground based troops, and were instrumental in aiding UN ground forces during the Battle of Chosin Reservoir. The Vietnam War saw the introduction of helicopter gunships which could be employed to support ground based forces, and the experience gained in Vietnam would spawn the creation of several aircraft during and after the war designed specifically to aid ground forces, including the AC-47 Spooky, Fairchild AC-119, Lockheed AC-130, and A-10 Thunderbolt II, all of which are operated by the Air Force, and the F/A-18 Hornet which is operated by the Navy. In addition, the Army and Marine Corps operate UH-1 Iroquois, AH-1 Cobra, and AH-64 Apache helicopters for close air support, and these helicopters can be stationed onboard amphibious assault ships to provide ship-to-shore air support for ground forces. These aircraft would later prove instrumental in aiding ground forces from the 1980s onwards, and would be involved in the 1991 Gulf War, the 2001 invasion of Afghanistan, and the 2003 invasion of Iraq. Starting after the invasion of Iraq, the air force began arming unmanned drone aircraft to perform strike missions. Originally designed for prolonged surveillance (and ironically to act as spotters for naval artillery), these aircraft typically have greater endurance than manned strike aircraft and some degree of automation to allow them to patrol for activity without requiring the constant attention of a pilot. This permitted the fielding of a less expensive aerial force which could maintain constant surveillance for enemy targets and conduct strikes on any targets encountered. Arleigh Burke-class guided missile destroyers use their Vertical Launch Systems to fire Standard missiles[disambiguation needed] during a live fire exercise. The rise of precision strike munitions in the 1970s and 1980s reduced the need for a massive naval bombardment against an enemy force, as missiles could now be used against such targets to support ground forces and to destroy targets in advance of the arrival of troops. Guided missiles could also fire much further than any naval gun, allowing for strikes deep into the heart of enemy territory without risking the lives of pilots or airplanes. This led to a major shift in naval thinking, and as a result ships became more dependent on missile magazines than on their guns for offensive and defensive capabilities. This was demonstrated in the 1980s, when all four recommissioned battleships were outfitted with missile magazines, and again in the 1991 Gulf War, when both Missouri and Wisconsin launched missile volleys against targets in Iraq before using their guns against Iraqi targets on the coast. The same conflict saw the first use of submarine-launched cruise missiles when the Los Angeles-class attack submarine Louisville fired Tomahawk Land Attack Missiles into Iraq from the Red Sea. Between 2002 and 2008, four of the Ohio-class submarines were converted to SSGNs carrying cruise missiles instead of SSBNs carrying ballistic missiles. Each SSGN carries 154 Tomahawk cruise missiles. The Iowa-class battleships were maintained and used because their 16" Mark 7 guns were considered more effective than the smaller 5" Mark 45 guns found on modern frigates, cruisers, and destroyers. Each battleship had a main battery of nine 16" guns and a secondary battery of twenty 5" guns, while the smaller modern ships have a single 5" gun. The 5" gun was the largest gun remaining in active Navy service after the battleships were decommissioned. In the 1960s, following a requirement established by Chief of Naval Operations (CNO) for a new gun capable of firing semi-active laser guided projectiles (SAL GP), the Naval Surface Warfare Center Dahlgren Division worked on the Major Caliber Lightweight Gun (MCLWG) program, testing capability of destroyer-sized ships to provide shore bombardment support with the range previously available from decommissioned cruisers. The 8"/55 caliber Mark 71 gun, a single gun version of the 8"/55 Mark 16 caliber gun was mounted aboard the USS Hull (DD-945). After at-sea technical evaluation in 1975 and operational testing that followed through 1976, The Operational Test and Evaluation Force determined inaccuracy made the gun operationally unsuitable. The lightweight 8"/55 was concluded to be no more effective than the 5"/54 with Rocket Assisted Projectiles. Program funding was terminated in 1978. In the 1980s, conventional guns were used by US destroyers during the Lebanese Civil War to shell positions for the Multinational Force in Lebanon operating on the ground. Guns were also used by the Royal Navy in the Falklands War to support British forces during the operations to recapture the islands from the Argentinians. For example, the Type 42 destroyer HMS Cardiff was required to fire at enemy positions on the islands with her 4.5-inch gun. In one engagement she fired 277 high-explosive rounds, although later problems with the gun prevented continual use. Ship-based gunfire was also used during Operation Praying Mantis in 1988 to neutralize Iranian gun emplacements on oil platforms in the Persian Gulf. Although the smaller caliber guns are effective in combat, larger caliber guns can have a large psychological effect, as occurred during the bombardment of Iraqi shore defenses by the battleships Missouri and Wisconsin in the Gulf War. When the latter battleship returned to resume shelling the island, the enemy troops surrendered to her Pioneer UAV launched to spot for the battleships' guns rather than face another round of heavy naval artillery. The navy looked into creating precision guided artillery rounds for use with the current fleet of cruisers and destroyers. The most recent attempt to modify the guns for longer range came with the Long Range Land Attack Projectile (LRLAP) munitions for the Advanced Gun System mounts installed aboard the Zumwalt-class destroyers. The navy was involved in the LRLAP and Ballistic Trajectory Extended Range Munition, both cancelled efforts to develop Extended Range Guided Munitions. In addition to funding research into various extended range munitions, the navy is also working on developing railguns for use with the fleet at some point in the future. 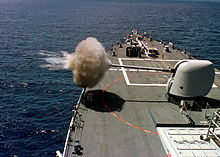 The United States Naval Surface Warfare Center Dahlgren Division demonstrated an 8 MJ rail gun firing 3.2 kilogram (slightly more than 7 pounds) projectiles in October 2006 as a prototype of a 64 MJ weapon to be deployed aboard navy warships. The main problem the navy has had with implementing a railgun cannon system is that the guns wear out due to the immense heat produced by firing. Such weapons are expected to be powerful enough to do a little more damage than a BGM-109 Tomahawk missile at a fraction of the projectile cost. Since then, BAE Systems has delivered a 32 MJ prototype to the Navy. On January 31, 2008, the US Navy tested a magnetic railgun; it fired a shell at 2520 m/s using 10.64 megajoules of energy. Its expected performance is over 5800 m/s muzzle velocity, accurate enough to hit a 5-meter target from 200 nmi (370 km) away while shooting at 10 shots per minute. It is expected to be ready between 2020 and 2025. Apart from railguns, 16 inch scramjet rounds with ranges of up to 400 nautical miles that have a 9-minute time of flight were proposed by Pratt and Whitney, working with Dr. Dennis Reilly, a plasma physicist with extensive experience with munitions, but the navy had no interested sponsor. The Zumwalt-class destroyers were to replace battleship gunfire support. New Jersey remained on the NVR until the Strom Thurmond National Defense Authorization Act of 1999 passed through Congress 18 October 1998. Section 1011 required the United States Secretary of the Navy to list and maintain Iowa and Wisconsin on the Naval Vessel Register, while Section 1012 required the Secretary of the Navy to strike New Jersey from the Naval Vessel Register and transfer the battleship to a not-for-profit entity in accordance with section 7306 of Title 10, United States Code. Section 1012 also required the transferee to locate the battleship in the State of New Jersey. [clarification needed] The navy made the switch in January 1999. Iowa and Wisconsin were finally stricken from the Naval Vessel Register in 2006. Prior to the reduction of ships in the Zumwalt program, it seemed unlikely that the above four conditions would have impeded the plan to turn Iowa and Wisconsin into museum ships because the navy had expected a sufficient number of Zumwalt destroyers to be ready to help fill the NSFS gap by 2018 at the earliest, but the July 2008 decision by the navy to cancel the Zumwalt program left the Navy without a ship class capable of replacing the two battleships removed from the Naval Vessel Register in March 2006. James T. Conway, Commandant of the Marine Corps has said that missiles fired from the littoral combat ship could fulfill the USMC needs for NSFS. This would not be the current NLOS-LS program as the range of the PAM missile at 22 miles (35 km) falls short of the threshold requirement for NSFS of 41 miles (66 km) and the number of CLUs the current LCS designs can carry in a ready to fire configuration is also short of the required volume of fire. The Loitering Attack Missile could have matched the required range, but it was cancelled in 2011 and the LCS would still have fallen short in terms of rounds ready to fire. On 15 September 2015, then Presidential candidate Donald Trump, while giving a speech on defense during the campaign for the 2016 presidential election on board the battleship Iowa in San Pedro, California, briefly remarked in having interest in recommissioning the Iowa-class battleships. After the completion of sea trials which began in 2014 Zumwalt was officially commissioned into the US Navy on 15 October 2016 at Baltimore, Maryland. But in November 2016 the principal and only ammunition for Zumwalt's two 155 mm Advanced Gun Systems, the Long Range Land Attack Projectile, was cancelled due to increased costs. Zumwalt is currently[when?] assigned to the US Pacific Fleet and is homeported in San Diego, California. ^ a b "City to take ownership of USS Wisconsin". Associated Press. 14 April 2010. Archived from the original on 16 April 2010. Retrieved 15 April 2010. ^ Government Accountability Office (1999-06-11). "Naval Surface Fire Support Program Plans and Costs (GAO/NSIAD-99-91)" (PDF). Government Accountability Office. Retrieved 2007-03-12. ^ a b c d e * Government Accountability Office (2004-11-19). "Information on Options for Naval Surface Fire Support (GAO-05-39R)" (PDF). Government Accountability Office. Retrieved 2018-03-04. ^ Holland, W. J. (2004). The Navy. China: Barnes & Noble, Inc., by arrangement with Hugh Lauter Levin Associates, Inc. p. 184. ISBN 076076218X. ^ a b "BB-61 IOWA-class (Specifications)". Federation of American Scientists. Retrieved 2006-11-26. ^ Johnston, Ian & McAuley, Rob (2002). The Battleships. London: Channel 4 Books (an imprint of Pan Macmillan, Ltd). p. 183. ISBN 0-7522-6188-6. ^ Naval Historical Center. "Iowa". Dictionary of American Naval Fighting Ships. Navy Department, Naval History and Heritage Command. Retrieved 2018-03-04. ^ Naval Historical Center. "New Jersey". Dictionary of American Naval Fighting Ships. Navy Department, Naval History & Heritage Command. Retrieved 2018-03-04. ^ Naval Historical Center. "Missouri". Dictionary of American Naval Fighting Ships. Navy Department, Naval History and Heritage Command. Retrieved 2018-03-04. ^ Naval Historical Center. "Wisconsin". Dictionary of American Naval Fighting Ships. Navy Department, Naval History and Heritage Command. Retrieved 2018-03-04. ^ a b c 104th Congress, House of Representatives. National Defense Authorization Act of 1996. p. 237. Retrieved 17 December 2006. ^ John Pike. "BB-61 Iowa-class Reactivations". Globalsecurity.org. Retrieved 2010-02-06. ^ a b c d "National Defense Authorization Act of 2007" (PDF). pp. 193–194. Archived from the original (PDF) on September 23, 2008. Retrieved 2007-03-12. ^ a b Matthews, William (2007-03-25). "Navy ends ERGM funding". Navy Times. Retrieved 2008-04-23. ^ a b c Government Accountability Office (1999-09-14). "Evaluation of the Navy's 1999 Naval Surface Fire Support Assessment (GAO/NSIAD-99-225)" (PDF). Government Accountability Office. Retrieved 2018-03-04. ^ "National Defense Authorization Act of 2007 Archived September 23, 2008, at the Wayback Machine" (pdf) pp. 109th Congress, United States Senate and House of Representatives. 69–70. Retrieved on 2008-08-01. ^ a b Cavas, Christopher P. (2008-07-24). "DDG 1000 program will end at 2 ships". Navy Times. Retrieved 2008-07-27. ^ "US House, Senate Agree to Add 3rd DDG 1000". Defense News. 24 September 2008. Retrieved 2008-10-07. ^ Labs, Eric J. (2008-07-31). "The Navy's Surface Combatant Programs" (PDF). Congressional Budget Office. pp. 3–9. Retrieved 2008-08-02. ^ a b Ewing, Philip; Bryan Mitchell (2008-08-01). "Navy:No Need to Add DDG 1000s After All". defense news. Army Times Publishing Company. Retrieved 2008-08-06. ^ Program Executive Office, Ships (2007-05-27). "DDG 1000 (subsection: What is DDG 1000?)". United States Navy. Archived from the original on 2007-06-14. Retrieved 2007-06-24. ^ Novak, Robert (2005-12-06). "Losing the battleships". CNN.com. Retrieved 2008-07-25. ^ The Marine Corps supported the strategic purpose of reactivating two battleships in accordance with the National Defense Authorization Act of 1996 and supported the Navy's modernization efforts to deliver a sufficient NSFS capability that would exceed that of the Iowa-class battleships. See: Government Accountability Office. Information on Options for Naval Surface Fire Support. ^ Blazar, Ernest (1996-07-29). "New debate resurrects old one; critics say cancel arsenal ship, bring back battleships". Navy Times. ^ "Navy proposes destroyer with long-range guns". USA Today. 2005-08-15. ^ This number was based on a 1999 estimate with a 4% annual inflation rate. See: Government Accountability Office. Information on Options for Naval Surface Fire Support. ^ The U.S. Navy reported in the April 1987 edition of All Hands that the original cost of bringing the battleships back in the 1980s was $110 million per ship, but the actual cost after modernization and recommissioning was $455 million. See: Bureau of Naval Personnel, "Back on the battle line". ^ The U.S. Navy reported in the April 1987 edition of All Hands that while battleships had larger crews than other vessels the level of training required and the criticality of that training were less than that required of a crew aboard an Oliver Hazard Perry-class frigate. See: Bureau of Naval Personnel, "Back on the battle line". ^ a b 109th Congress, House of Representatives. Report 109–452. National Defense Authorization Act of 2007. p. 68. Retrieved 26 November 2006. ^ "The Republic P-47 Thunderbolt". Greg Goebel. 2006-06-01. Retrieved 2008-10-07. ^ "American Military Aircraft (F-86 in Korea)". Home.att.net. Archived from the original on 2008-07-24. Retrieved 2010-02-06. ^ a b United States. Office of the Chief of Naval Operations. (1991-05-15). "V: "Thunder And Lightning"- The War With Iraq". The United States Navy in "Desert Shield" / "Desert Storm". Washington, D.C.: United States Navy. OCLC 25081170. Retrieved 2006-11-26. ^ "Report of Proceedings". HMS Cardiff—The 1982 Ship's Company. Archived from the original on 2008-05-26. Retrieved 2008-02-12. ^ "Operation Earnest Will". globalsecurity.org. 2005-04-27. Retrieved 2008-10-07. ^ Federation of American Scientists. Pioneer Short Range (SR) UAV. Retrieved 26 November 2006. ^ National Air and Space Museum, Smithsonian Institution. Pioneer RQ-2A. 14 September 2001. Retrieved 26 November 2006. ^ Zitz, Michael (2007-01-17). "A missile punch at bullet prices". Fredericksburg.com. Archived from the original on 2012-06-04. Retrieved 2008-10-07. ^ Sofge, Erik (2007-11-14). "World's Most Powerful Rail Gun Delivered to Navy". Popular Mechanics. Archived from the original on November 16, 2007. Retrieved 2008-10-07. ^ "U.S. Navy Demonstrates World's Most Powerful EMRG at 10 Megajoules". ^ Shawn Welch, Colonel, Corps of Engineers United States Army. Joint and Interdependent Requirements: A Case Study in Solving the Naval Surface Fire Support Capabilities Gap Archived April 8, 2013, at the Wayback Machine. Joint Advanced Warfighting School Masters Thesis. Retrieved 2012-11-19 from Defense Technical Information Center. ^ "Strom Thurmond National Defense Authorization Act of 1999 (Subtitle B-Naval Vessels and Shipyards)" (PDF). 105th Congress, United States Senate and House of Representatives. pp. 200–201. Archived from the original (PDF) on 2007-06-20. Retrieved 2007-03-12. ^ "Conway: Rockets on LCS Could Fill Naval Surface Fires Requirement". Archived from > the original on July 13, 2011. Retrieved 2009-01-23. ^ "Marines Pushing Ahead On Corps-Specific Module Ideas For LCS INSIDE THE NAVY 27 OCT 08". Archived from the original on December 14, 2009. Retrieved 2009-01-24. ^ "Gates Reveals Budget Efficiencies, Reinvestment Possibilities". Defense.gov. Archived from the original on May 29, 2011. Retrieved 2011-05-27. ^ "Commandant says Marines will field their own gunships". Govexec.com. Retrieved 2010-02-06. ^ Rogoway, Tyler. "Donald Trump's Crazy Idea To Bring Back Battleships Might Actually Be Possible". jalopnik.com. Bureau of Naval Personnel (April 1987). "Back on the battle line" (PDF). All Hands. Washington, D.C.: United States Navy. 841: 28–29. ISSN 0002-5577. OCLC 2555618. Archived from the original (PDF) on 2006-04-16. Retrieved 2008-06-27. Coram, Robert. Boyd: The Fighter Pilot Who Changed the Art of War. Los Angeles: Back Bay Books, 2004. ISBN 0-316-79688-3. DiGiulian, Tony (2008-07-02). "United States of America 16"/50 (40.6 cm) Mark 7". NavWeaps.com. Retrieved 2007-01-16. Major B. T. Kowalski; United States Marine Corps (1995). "Naval Surface Fire Support, Is It A Viable Option?". Keegan, John (2000). World War II: A Visual Encyclopedia. London: PRC Publishing. ISBN 1-85585-878-9. OCLC 45188820. Miller, David; Chris Miller (1986). Modern Naval Combat. London: Salamander Books. ISBN 0-86101-231-3. OCLC 17397400. Muir, Malcolm, Jr. (1987). The Iowa-Class Battleships: Iowa, New Jersey, Missouri, Wisconsin. Poole, Dorset: Blandford Press. ISBN 0-7137-1732-7. OCLC 17509226. Sumrall, Robert F. (1988). Iowa Class Battleships: Their Design, Weapons & Equipment. Annapolis, Maryland: Naval Institute Press. ISBN 0-87021-298-2. OCLC 19282922. This page was last edited on 14 March 2019, at 18:04 (UTC).